I am a bit of a believer in good omens. After a great Easter/Passover weekend on the East End of Long Island the family headed off to Boston. The weather forecast was not promising. Chance of rain everyday. We started our trip on the ferry from Orient Point to New London, CT. It was a wonderful ride. The sun was out, the seas were relatively calm and the you could see all the way to the Connecticut coastline. On the ride we saw seals, porpoises and, as we came into New London, the Coast Guard escorting a submarine into port. We couldn't have asked for more. We docked in New London around 12:30 pm. We had some good friends joining us on the trip. They were in Mystic at the aquarium awaiting our call. K had done some research and found a spot where we could rendezvous for lunch. Kitchen Little in Mystic. 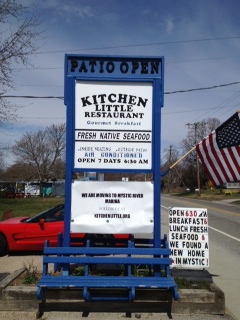 Kitchen Little has been serving breakfast and lunch on the water in Mystic, CT for over 25 years. As the name indicates, it is a tiny place. The dinning room holds maybe 24 people and the heated back patio another 30. We sat out back, with a view of the water. Kitchen Little is renowned for both their breakfasts as well as their seafood. We arrived for lunch, and because we were officially in New England I had one thing on my mind, seafood. After considering my options I settled on a cup of Flo's Famous Clam Chowder and the Bomster Sea Scallop Roll. The chowder was tasty. It had a nice light broth with a clean flavor and healthy portions of chopped clams and potatoes. Definitely a good start. But the home run of the meal was the Bomster Sea Scallop Roll. Full disclosure, I love scallops. I have since I was a kid. The two weeks in the fall when the bay scallops come in is one of my favorite times of the year. So I had high hopes for the Bombster. It was beyond my expectations. The scallops are not some pre-fried and frozen dreck from a bag. These scallops are fresh off the boat from the Bomster family in Stonington, CT. They are lightly breaded and delicately fried to perfection. Thick and juicy, they almost melt as you eat them. These are some of the best scallops I have ever had. They come served on a split hot dog bun (as it should be) with tartar sauce and a lemon wedge on the side. 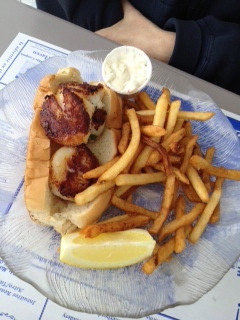 A light squeeze of the lemon and just a touch of the tarter sauce is all the scallops need, if that. The fries are an after thought. All you can focus on are the remarkably succulent scallops on your plate. I do not exaggerate. But wait, there is more. Because Kitchen Little serves fresh seafood, and prepares it to order, you can get the scallops, fish sandwich or any of the seafood prepared how you like it. Hearing this, K ordered the Bomster Roll but with the scallops sauteed instead of fried. I know what you are thinking. Sacrilege! This is a roadside seafood restaurant. The scallops should be fried. Normally I would agree. But I tried K's sauteed Bomster Roll. Oh Man. Now, I am not saying I don't prefer the fried scallops. But the sauteed scallop roll was fantastic as well. It makes sense. Take some of the best, fresh scallops you have ever eaten, lightly sauteed them and serve them on a split hot dog bun (as it should be) with a little tartar sauce and lemon. You cannot go wrong. No matter which way you prefer it, the Kitchen Little Bomster Sea Scallop Roll should be in the seafood roll hall of fame. It is the kind of dish you go out of your way to find. As the joke goes, I have good news, and I have bad news. First the bad news. On April 23, after more than 25 years in business, Kitchen Little is closing. Apparently their neighbor bought the property, jacked up the rent, and so no more Kitchen Little. Same old story. Now the good news. On April 26 Kitchen Little opens in their new location at the Mystic River Marina just down the road. Of course you always worry when something like this happens. Will the spirit, charm and great food of the old location be gone? You never know. The positives here are that Kitchen Little will live on, they will have more seating (so less waiting), and there is even talk of serving dinner. Sounds good to me. The good omen of our Ferry ride proved true. The first meal on our vacation was one to remember. I had high hopes for the rest of them, and the rest of our break. mouth watering. experiencing a rare wish for New England - and wishing not only for the scallops but also the ferry, which I've seen with one eye on the train as I zoom up to boston, but never actually taken. Clearly, a mistake! Are you interested in a college education? check this to know how to get it for free!